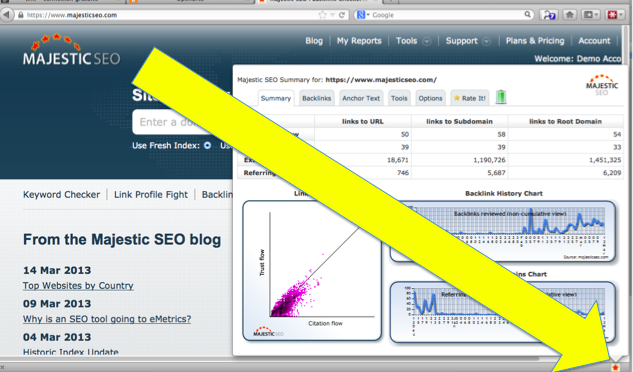 Today we are happy to announce the official release of Majestic’s Backlink analyzer Firefox Addon. This follows on the heels of our Chrome Extension launched back in December. Once installed, the plugin is so patient and inconspicuous, you won’t even know it’s there unless you click on the star in the bottom right hand corner of your browser. As soon as you do, the extension springs into life, bringing all the important parts of Majestic right onto your browser. For every user (even non-paying subscribers) you will see headline information about backlink counts, Referring domain counts at those all important Flow metrics. To start enjoying the full functionality of the plugin, you should link your Majestic SEO account. Do this by clicking the “Options” tab and following the simple instructions on the screen. 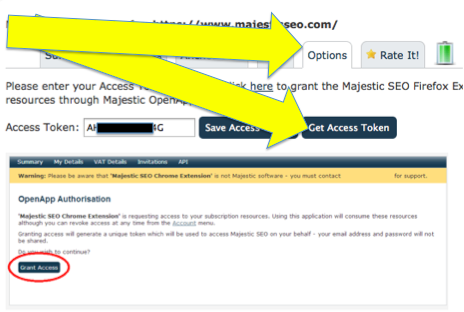 If you do not have a paid account with Majestic, you can also set one up from there. (They start at UK£29.99/US£49.99/€39.99). 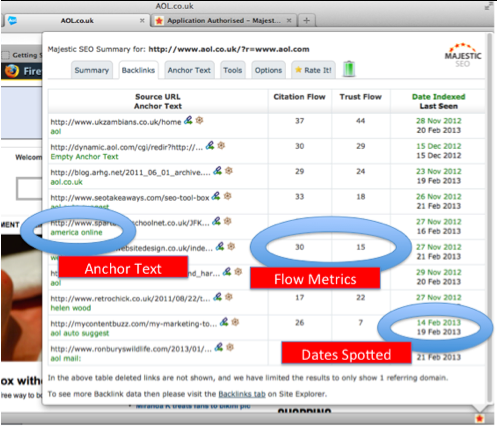 From there you can see your top backlinks and your top anchor text, along with easy access to our most popular tools. We are delighted that Softpedia has already analyzed the plugin and confirmed that it contains nothing that will spy on you. We hope you will enjoy the plugin. Thanks for the update, and the new plugin. Keep up the good work. I am sure I will enjoy this. Keep it up! Does not work for firefox 17 as it is unavailable for that version. How do I get notified when it is available for that version? Firefox is being updated very quickly and it’s on version 19 now, we’ll test next week with 17 but given how quickly browsers get updated it might be a bit difficult to support multiple older versions. The tool is really cool and exactly what I was looking for as an add-on from you guys. Is there a way to set it so that the summary is for the root domain? Not at the moment – but not a bad idea. Any chance to get this plugin for Chrome? We built that back in December. If you set your newsletter settings to on in your accounts settings, we’ll send you (ONE) monthly update. Great Add-on! We use MajesticSEO all the time and this is sure to increase productivity for everyone!!! Thank you! Firefox Add-ons are really helpful in seo. Thanks for such a nice update. 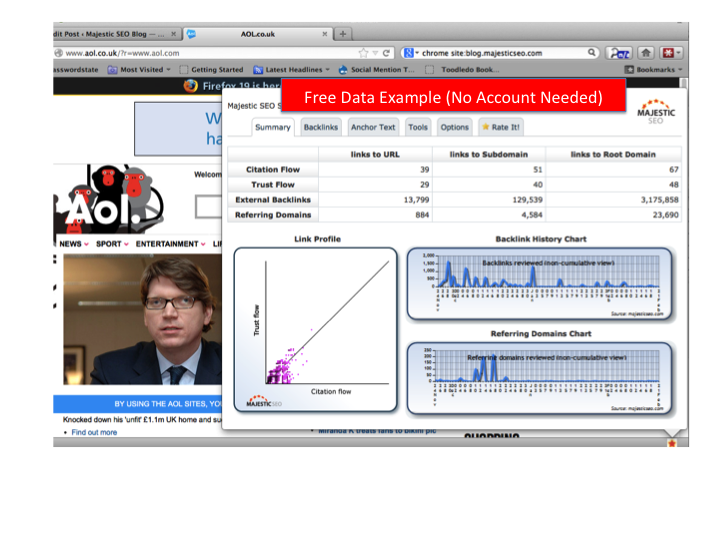 We are data driven… You’ll need to increase the number of Opera users on our site first I am afraid. I have been waiting for this tool for quite some time now…That is indeed a great resource. Does anybody else have this problem with Mozilla often crashing where there is 20+ tabs open? Anyways – thanks for another great tool, will definitely give it a shot. Will this work with free subscription? When I click get token, it takes me to majesticseo page where I am already logged in, but then tells me to go to subscriptions page and pick one. I already have one. How do I get the token? Firefox addon provides free data, however if you wish to see ALL data that would require a token that is only available to paid subscribers. Both addons are useless for Free users. We can only give limited data for free. We give link counts, Referring Domain counts, Trust Flow and Citation Flow at the URL, sub-domain and ROOT domain level. So I would not say that’s useless, as this data is not free to collect and calculate. Paid subscription start at £30/US$50 a month. I’ve been looking forward to an add-on like this. However, I have added the add-on and enabled it but it doesn’t show in the bottom right corner…. nor anywhere. View > Toolbars > Add-on Bar. > Ah – ha – that worked – thanks. for Mac? Works great with Chrome on my Mac. Hi Mike. It’s working fine on my Mac! Have a look at the View Addons bar comment above. I am curious what version of Firefox you are using? When I try to download anyway. I am afraid you’ll need to upgrade your Firefox to more current version – current version is v19 and sadly it’s not possible for us to support very old versions of Firefox, sorry! 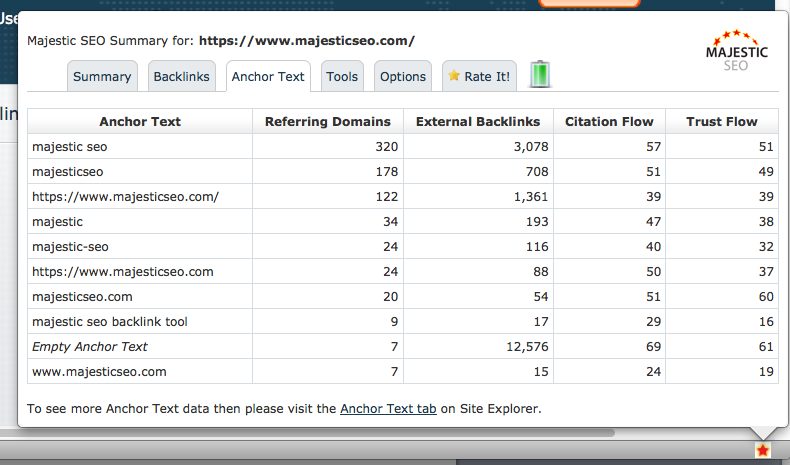 Have found v19 and Majestic SEO Backlink Analyzer 0.9.1 works great ! Thanks again for providing this tool. What a sweet extension. It certainly makes analyzing backlinks for a page much faster. I somehow missed the Chrome Extension release back in Dec, but I’m going to add it now. Keep’em coming! > Glad you like it Shay! It certainly makes for an easier life. We’ve got some ideas on how to improve it, too.